Hey there! Excuse me if I ask any dumb questions, but I know nothing about Hondas. The only vehicles I've ever owned are American trucks and SUVs. Anyway, for my mother's birthday I'd like to help her with her Honda Accord. Originally she had a CD changer in the trunk to accompany the OEM cassette/radio head unit in the car but the CD changer made it hard to fit large items in the trunk and died so we got rid of it. Also, at this point the tape player doesn't work either, and even the radio has poor reception, which is why this whole thing is long overdue. 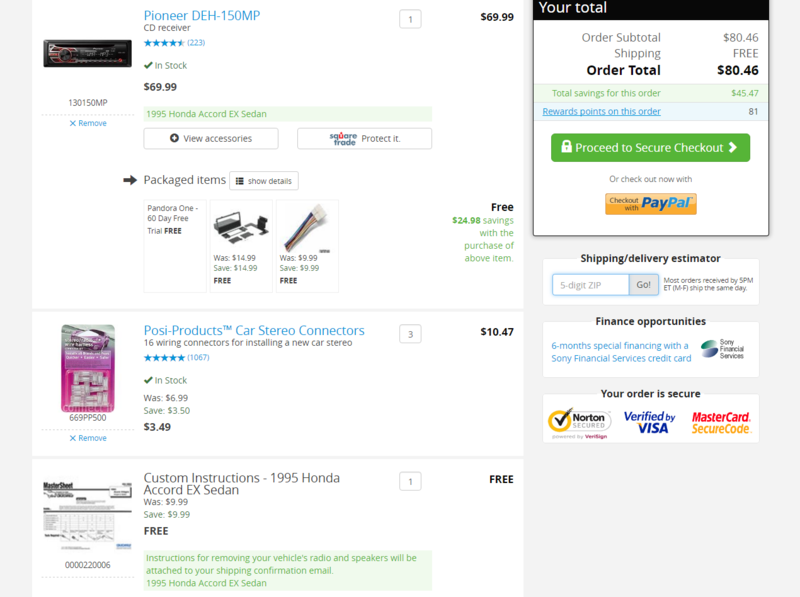 Ignoring all the extra connectors (I'm ordering extras because I'm about to replace the stereo in my GMC Envoy), does this order make sense? I know that isn't a high-end head unit but since my mother will primary be using FM radio and an old walkman tape player through the aux port I'm assuming that sound quality will be the same as the OEM stereo if not better? Assuming that order looks acceptable, what about the power radio antenna operation? I did a live chat with Crutchfield but besides "yes it'll work" they didn't explain how or what I needed to do. As far as the process, I found that video, doesn't seem too hard - that said, the plastics are probably pretty brittle after 20 years - any suggestions to make it go smoothly? Last edited by shovenose; 05-23-2016 at 11:00 PM. Honda's are super easy to work with, easier than domestic brands. Replacement will be very straight-forward and the video and included instructions will make it a breeze. You are smart for shopping with Crutchfield. Power antenna is the blue wire in the pioneer radio harness. You may want to take a moment to consider the cosmetics of the radio. Your ma may prefer a look that is simpler, I usually look to Kenwood or Alpine before Pioneer or JVC. But regardless, the installation will be the same. Hey, thank you for the warm welcome and great information! I do agree that Pioneer (and most other head units these days) look gaudy and ugly and have clunky user interfaces. That said, every Pioneer I've ever owned has sounded excellent and been very reliable, which is why I usually lean in that direction. My last Kenwood looked professional but sounded terrible. Last edited by shovenose; 05-24-2016 at 10:27 PM. After replacing the OE headunit in my 94, I'd recommend adapter plugs. I used wire nuts, small gray ones. Worked fine, but time plugging in adapters vs cutting, stripping and nutting, you see where I'm going with this. Honestly back in the day when I was a go to guy among friends for stereo installs, I ran all new wires but didn't have the time on this.